At least once a week allocated for Peer Tutoring. Students are able to consult our TPS tutors at any point in the semester regarding assistance with assignment writing. They can help you with aspects such as question analysis, referencing, assignment structure, logical presentation of ideas, sentence structure, and other writing skills. Please note that for each of the courses enrolled, there is a main textbook that students are recommended to purchase and other textbooks and journals for reading and referencing that can be found in the libraries (internal and public libraries). Some of these reference books and journals are also accessible online from the Auckland City Library. Students are required to check from their UPORTAL details of their courses and also the name and the latest edition of the recommended textbooks related to the courses they are enrolled in. Unless requested by students to assist purchase their textbooks or reference books on their behalf, students are recommended to buy their textbooks or reference books from either AUT or UoA with the details as shown below. Important Notice!! All students are required to purchase text books for their courses as New Zealand law strictly prohibits excessive copying of textbooks and it is totally illegal to copy a whole textbook, in fact it is illegal to copy more than 10% of a textbook unless it is out of print. If you are unable to find information you need, please contact one of our Learning Support Officers who are based in the library. Please remember that you can access materials in other Libraries including Auckland City Library, 44-46 Lorne Street, Tel: 377 0209. All UUNZ students can access to the EBSCSO database for their academic enquiries, and search for academic journals and books directly from UPortal. We encourage all our international students to sign up for Auckland City library to be able to benefit from their physical and online recourses. It is free of charge. To become a member, students should to fill in an online form. This will give you 3 months temporary access. In order to have a full 1 year access, students should go directly to Auckland library with their student ID card and proof of address (bank statement etc. that shows their physical address). Online registration form: Google this term: ' Join the library - Auckland Libraries’, click on the first ink from the Google search result. Then click on the Sign up Now under the Adult membership section. Address: 44/46 Lorne St, Auckland, 1010 (within 5 minutes of walking from the UUNZ campus). A good dictionary will be a great advantage to you during your studies as you will encounter a wide range of new vocabulary during your studies. Please not that during examination only paper and NOT electronic dictionaries will be allowed into the examination room. 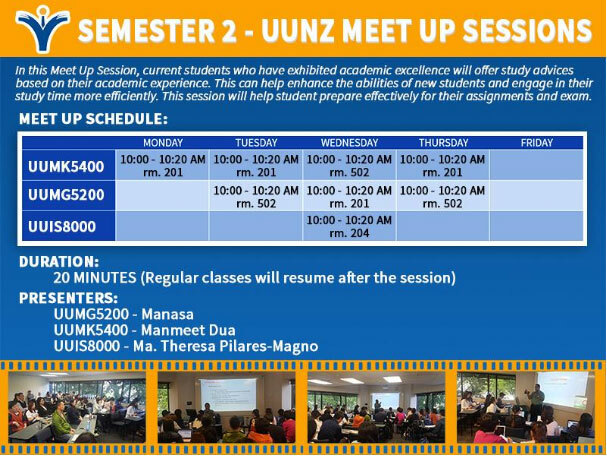 UUNZ student service team and interns will arrange for you the ‘Meet-up Sessions’ in the beginning of each semester. In the Meet-up session, current students who have exhibited academic excellence will offer study advices based on their academic experience. This can help to enhance the abilities of new students and to engage in their study time more efficiently. This also can help students to prepare effectively for their assignments and exam. UUNZ has a number of bilingual/multilingual personnel to care for students coming from various countries. There is always someone here to offer support and guidance in your studies and everyday issues while staying in New Zealand.